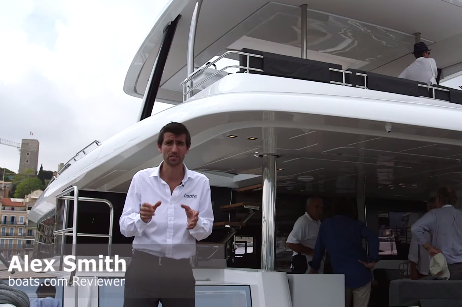 It’s been a long while since we witnessed a Lagoon motoryacht at an international boat show. In fact, having ceased production eight or nine years ago, it was uncertain whether we would ever see such a launch again. And yet if we’re to believe the company line, the phasing out of the powered craft back in 2006 was not so much about a product that was struggling. 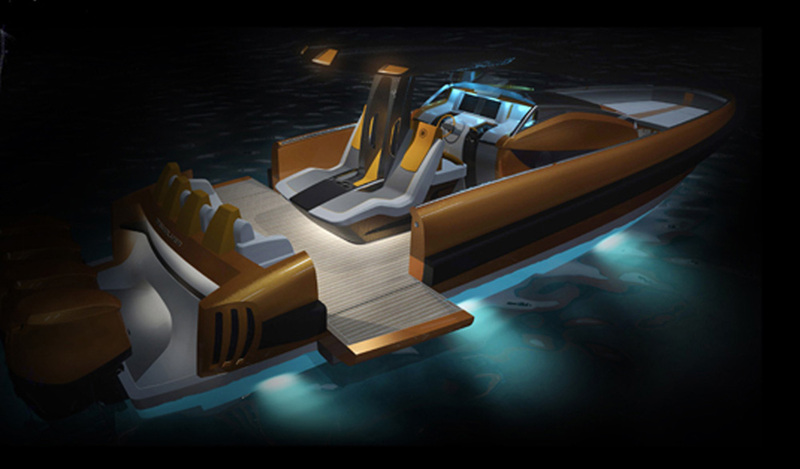 It was more to do with the fact that Lagoon needed to absorb some of that manufacturing facility in order to expand production of its sailing cats. 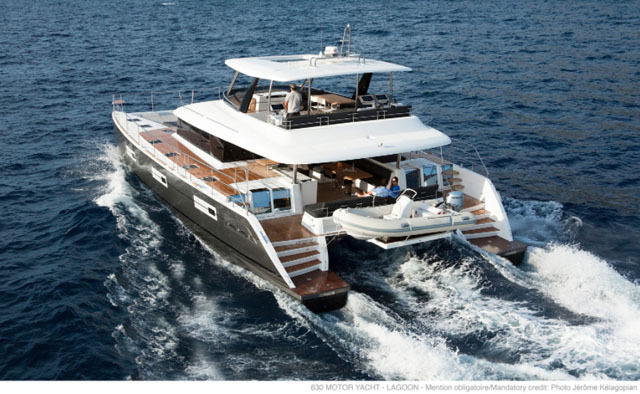 Either way, the reappearance of the Lagoon motoryacht in 2014 is a happy development – and while as powerboat enthusiasts, we might be tempted to speculate that this heralds a general shift in the global market from sail towards power, what is particularly interesting is that this new motoryacht in fact owes a great deal of gratitude to Lagoon’s established sailing fleet... Take a look for yourself in the Lagoon 630 First Look Video by Alex Smith. 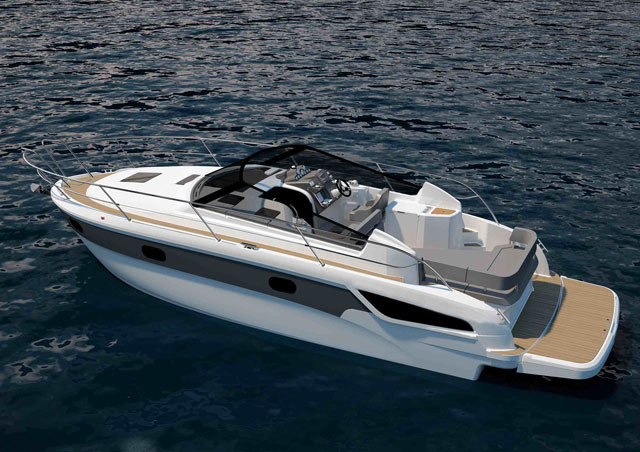 The new Lagoon 630 power catamaran is based on the best-selling 620 sailing cat. Together with Nauta Design and Van Peteghem-Lauriot Prévost, the Lagoon team decided that the most effective way to generate a new motoryacht would be to employ and adapt the basic shape and underpinnings of one of its sailing cats. Unsurprisingly, they chose the best-selling 620 – and when you step on board, the impacts of that decision are easy to see. For a start, the versatility of the 620 sailing cat is alive and well here. 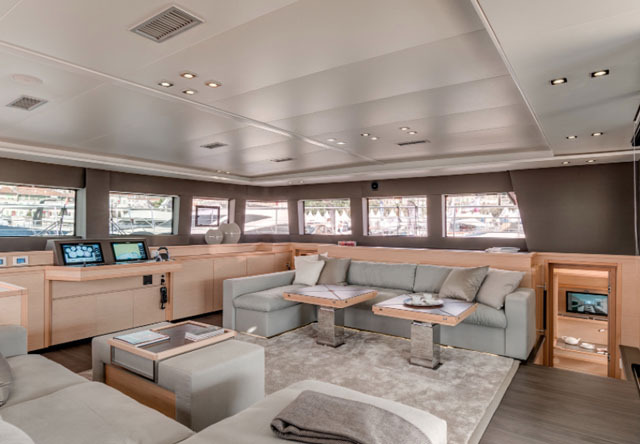 You get the same impressive choice of deck configurations, with four, five or six cabins and you also get the same option of positioning your galley either up on that cavernous main deck or down below in the port quarter. 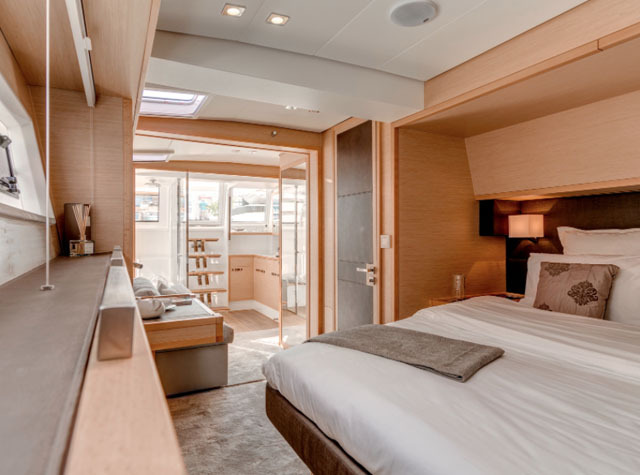 This particular debut vessel uses four cabins and a lateral galley, but remarkably, whichever layout you choose, all the cabins (even in the six-cabin configuration) come with dedicated ensuite facilities. 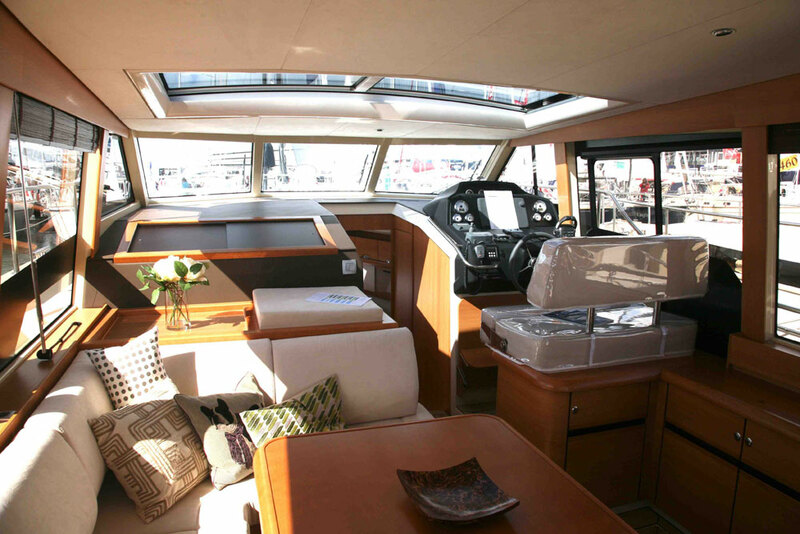 The single-level main deck aboard the Lagoon 630 is extremely impressive. While the 630 also inherits the 620’s topside structures, its hulls have received some important modifications at the aft ends in order to increase the buoyancy required to carry the engines. The keels have also been redesigned to help tweak directional stability and improve manoeuvring and with these changes in place, the theory is that a pair of standard Volvo D4-260 engines should bring you a cruising sweet spot at around 12 knots, a top end of 16 knots and an extremely generous cruising range. Even with the 3,000-litre fuel tank included in the standard package, this boat’s modest power demands and innate cruising efficiency, should be enough to see you making vast transits. But if you upgrade that to the optional 5,000-litre unit, the Lagoon’s cruising capacity should become truly trans-oceanic. 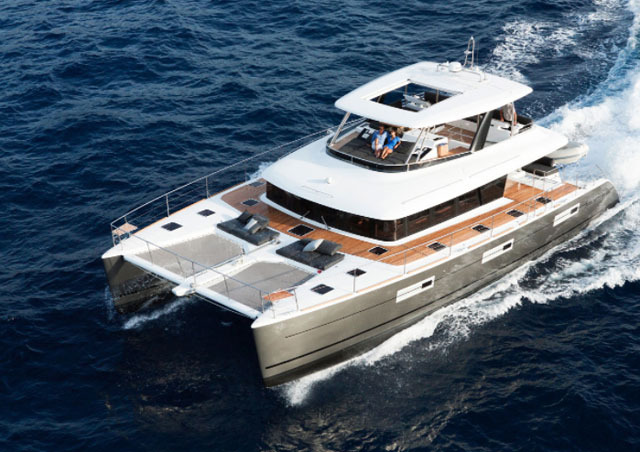 For an interesting comparison, take a look at: Fountaine Pajot Helia 44 First Look Video, Jaguar JC48 powercat First Look Video or the full-length boats.com Fountaine Pajot Sanya 57 review. Elsewhere, there is just one remnant of the 630’s sailing yacht heritage that I don’t much like and it comes in the form of a very thick stanchion running up the centre of the screen. A sailing colleague of mine assures me that this would have been part of the structure required to support the sailboat’s mast, but on the 630, it sits exactly in the way of the man at the wheel. Of course, these lower mouldings still have to support a pretty substantial flybridge, but given that the key strength of this boat is comfortable, long-distance, blue-water cruising, it would be good to see subsequent production models rectify this visibility issue. This lower lateral galley can be relocated on the main deck if you choose. At 10 metres in the beam (not far short of 33 feet), the Lagoon offers around twice the breadth of a comparable flybridge-equipped monohull. In fact, if you compare it to the broader monohull market, you would only tend to find a beam of this size on superyachts of perhaps 160 feet or more. In other words, by the standards of a 63-foot powerboat, the Lagoon generates truly vast internal capacity, with a scale of deck space and a versatility in layout that has to be seen first-hand to be fully appreciated. While the main deck (from the huge single-level saloon to the massive lateral walkways and the remarkable sun-worshipper’s foredeck) is extremely impressive, the really special part of the 630 when rigged like this is the owner’s quarters. Accessed down some steps on the starboard side of the saloon, it is essentially a self-contained apartment, with a double bed, a lounge, a small heads compartment and a large wet room. In fact, with private access up some steps and out onto the aft deck, plus plenty of natural light and a lovely palette of materials, this one of the very finest owner’s suites you will ever see. The main suite is a self-contained apartment with private access to the aft deck. Head up top to the flybridge and, while it’s not huge in terms of the 630’s overall footprint, the Lagoon’s potent combination of space, features and flexibility again makes itself evident. 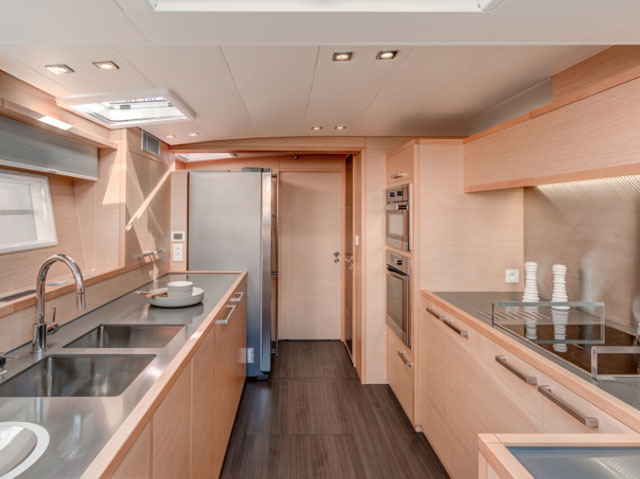 In addition to a pair of newly designed helm positions, you get a wet bar, an optional Jacuzzi and a very generous ten-man dining section with folding table to starboard. Up by the screen, a big lounging area enables you either to nestle in the shelter of the hard top or open one of the two sliding sunroofs for some more concerted sun. 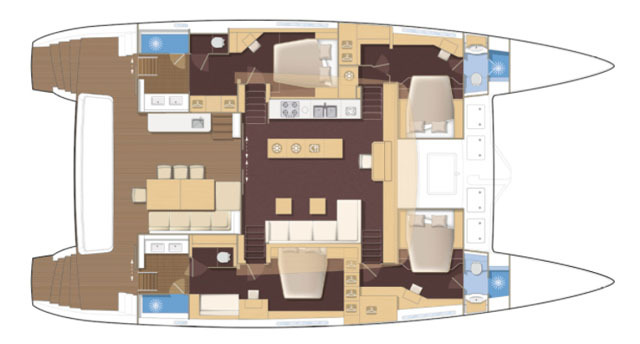 Whichever option you choose, the flybridge is well up to par with the lower decks. It’s only natural that powerboaters should view a modified sailing yacht with a healthy dose of skepticism. It’s also inevitable that monohull lovers will roll their eyes at the idea of a 33-foot wide cat (and the potential mooring fees associated with that). And yet with a huge, ocean-crossing range, vast reserves of space and comfort, a soft ride, immense stability at sea, an owner’s suite to kill for and great quality in materials and fit-out, it’s tough to see any substantive way in which the 630 falls short. 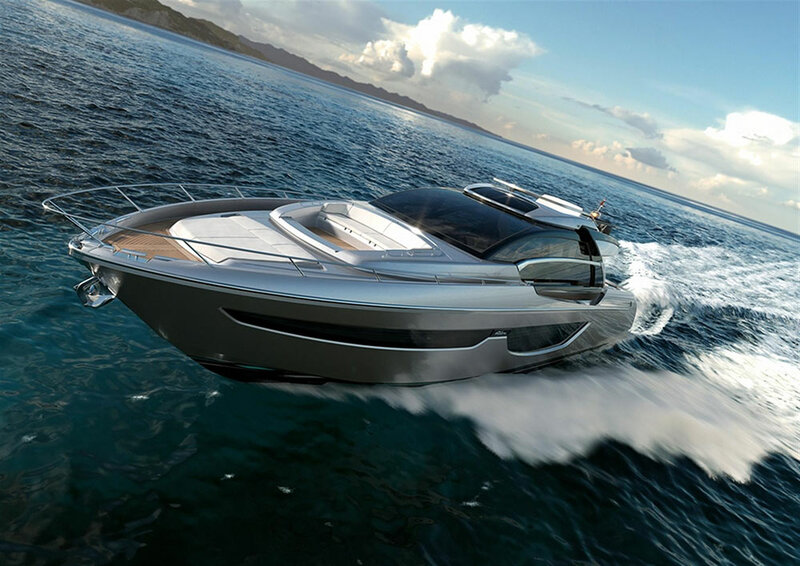 We haven’t yet helmed this boat on the open seas and we don’t yet know the price, but on the evidence of its appearance at the Cannes Boat Show, the 630 appears to represent a truly special renaissance for Lagoon Motoryachts. The four-cabin layout is superb, but even the six-cabin version has ensuite facilities for each cabin. 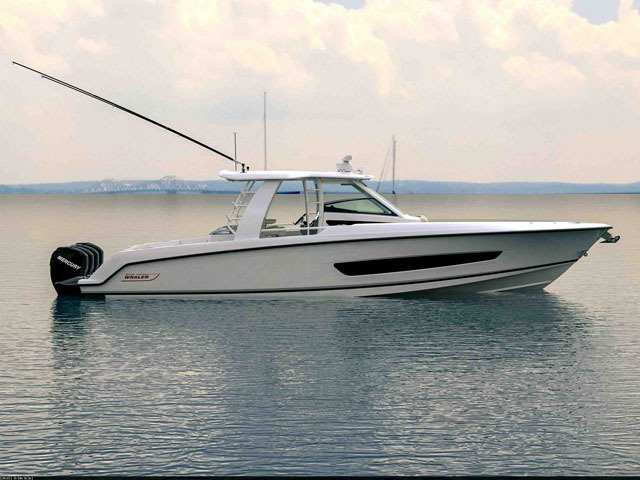 As 63-footers go, the new Lagoon 630 looks very tough to beat.